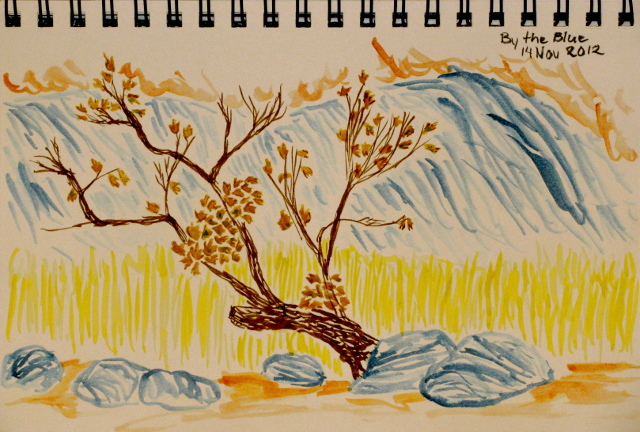 This month, I've been challenging myself to paint or sketch a tree a day, so the hiking sketches tend to feature a tree. I think manzanita qualifies as tree, anyway. 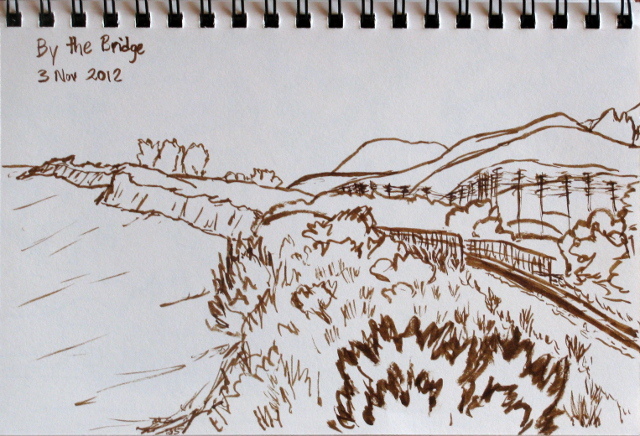 Some distant trees along the coast from near the Arroyo Hondo bridge. 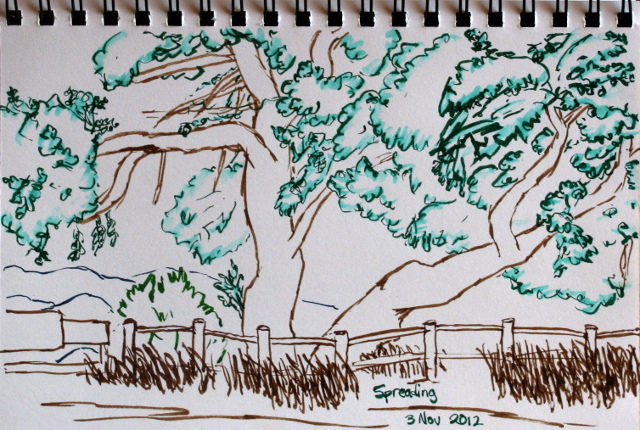 An oak next to the closed road down the north side of the ridge while driving a 4x4 road with inappropriate wheels. 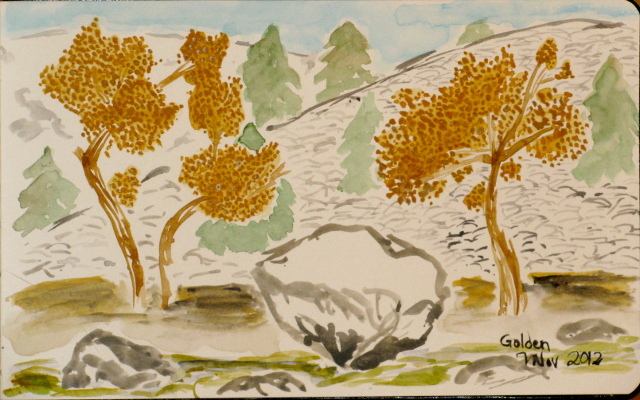 Some fall color along Piru Creek. A dry tributary with a waterfall that spills into Piru Creek. The tail end of fall color while exploring some more of Piru Creek. 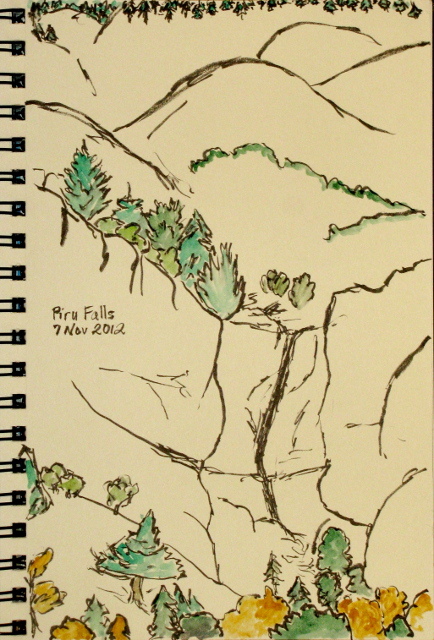 Mission Falls, nearly as dry as usual, hiked to by way of Rattlesnake Canyon. Failing to get a group to come out for the moon on Sunday, I decided to take a hike up Whitaker Peak on Tuesday when the moon would be fullest. 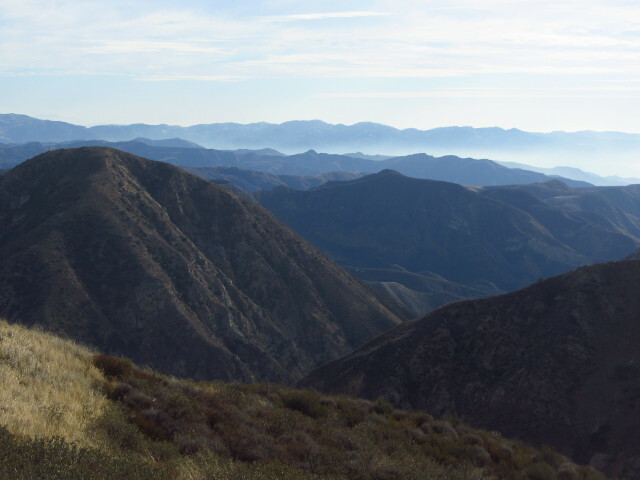 The mountain is tucked away in the Los Padres administered section of Angeles National Forest. I found rumors of a lookout at the end of the road, for instance it is labeled on the 1988 revision of the Whitaker Peak quad, but that has been completely removed now. The peak itself is off the road and does not have a good use trail. There was rain planned for Wednesday, so it would already be clouding up. I found a prediction that it would be 38% cloudy and deeply suspected it would be the wrong 38%, so was a bit slow to start off. The dithering cost an hour of hoped for hiking time, but there turned out to be plenty of time. I found a faded sign along the old Golden State Highway pointing to Whitaker Peak and turned up it to park by the gate. Starting up it, I found it to be paved and smooth, which would be easy for coming back by moonlight, but a little hard on the feet. Climbing to the ridge gives a view of the old road and new road while the mountains also come into view. For the first part, the hike is an easy climb up to the ridge. This gives great views of the string of trucks climbing the grade and another set coming down the other way. Also visibile is the break check area for those coming down. It isn't much of a view, but gradually the mountains beyond start to pop up behind the hills by the road. Redrock Mountain is particularly prominant showing off how unimaginative the namers were. The area over there, full of disappearing trails, doesn't look so inaccessible from the ridge and the closer hills have prominant roads crossing them. The view from the top of the ridge shows a well folded land to the southwest. Every year after the first big rain, I seem to go out to some local waterfall hoping that it is somewhat more impressive than it was a few weeks ago. Invariably, it isn't. The first rain barely wets the soil, even if it is long and soaking eventually dropping about 1.5 inches as fell on the front side of the mountains on Saturday. I decided to hike up to Mission Fall by the nicer, or at least cozier with easier parking and fewer mountain bikes, Rattlesnake Canyon. The mountains did not drink up every drop that fell on them, the creek is a bit louder than it was in recent months, but it doesn't really look like more flow and there isn't any flow in the little tributaries. The mountains did manage to take in a lot of it. The day was fairly cloudy with a layer out on the water as well. It was a really good temperature for hiking, but the patchy sunlight sure makes photography difficult. There is construction in the area at the moment, so I kept getting warned that the road was closed ahead. I parked on a paved bit just before the bridge at Skofield Park next to some huge machinery and a pile of metal plates and started up the trail at the same time as two cars worth of twenties and their dog. They were only loaded down with a pint of liquid and I'm a bit of a slow hiker even without a bit more water, nibbles, warm stuff, emergency kit, and even art supplies, so they outpaced me pretty quickly. Well, until the first stream crossing when they settled down for a smoke, at which point I passed them and didn't see them again. The trail quickly climbs up to give views of the city and island out over St. Mary's. With a little climb to a bit of view, the trail wiggles a little through trees and past a cairn marked route down, then drops down again to cross the creek. Passing the climbing wall, the rope strung from high on the rock was dangling down to the main trail along the steep use trail. Bright equipment still hangs from the stays in the rock. The trail crosses again, by a little pool and over a rock that shows a bit of flattening performed long ago. Climbing again, there is a little use trail down to the water to follow the creek up, but the main trail turns to leave it. The water can be heard below a few turns, but eventually it is lost. I got to the meadow just before the junction which I have just learned is Tin Can. I had read about a Tin Can Cabin and wondered if this was where it was, so found a nice little write up of Rattlesnake Canyon history in the LA Times archives, which mentions a few things I'd forgotten as well as describing the old cabin the meadow is named for. Tin Can Meadow from above on the connector trail. I headed again to Hungry Valley, this time with multiple plans. The road is marked as open 1 May to 1 Nov, but was open for hunting season, but now that the deer are safe again, the road can't be expected to be open. At the entrance station to Hungry Valley, I found out that the forest doesn't keep the state informed about the local area or even supply them with the free OHV maps, so all I found out was that there was a bit of a rough spot at the start of the Piru Creek ford going up Alamo. I set off to try to get to the upper end of Snowy Creek trail, listed as closed but doesn't say if that's just to bikes or all or if that's the whole trail or just part. I found that the ford was easy enough to cross, but the road is looking a bit more like when I first drove it. I came to a ditch that I couldn't cross without plowing a lot of dirt with my front bumper and had to turn around. It looks like I have to wait until they grade the road again before going up. I drove up to Kings Camp, noticing that fire crews were out picking up garbage at Gold Hill as I forded Piru again. King's Camp is the other end of Snowy Creek, which was really my plan C, but proximity to plan A made it the next to try. 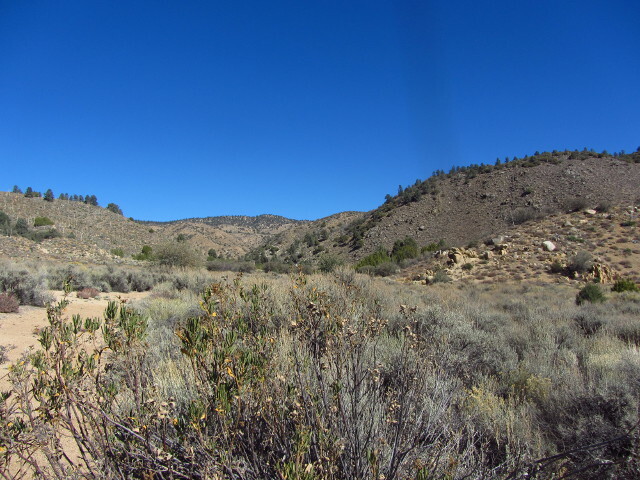 I must have been more uninterested in going on that end of the trail than I knew, because I could not find the trail head when I drove up into the campground loop, then over to another large dirt area. I should have found an open gate and a truck parked near it, but somehow missed that. I left as some youngsters settled in just past the "no target shooting" sign for their own purposes and proceeded to Hardluck. Back in summer 1995 when I was a counselor at Camp Tecuya and would get 24 hours off between the strings of 6 22 hour days in charge of campers, I sometimes wanted to be far away from people. One weekend, the little tent that said "Hardluck" on the map looked like the place to do so. It had no water, so was free. It had very solid pits that had been shot at a bit much, but there were still a few good ones. Too many people hadn't found the good ones, and decided a better choice was to squat by a bush. It had toilet paper tucked under every bush. Except for being disgusting with waste paper, it was a very nice spot. I had the place to myself when I went to bed, but had gained a neighbor two spots down by morning. My neighbor commuted from LA to Bakersfield every day and sometimes decided it was a long drive and set himself down in Hardluck. 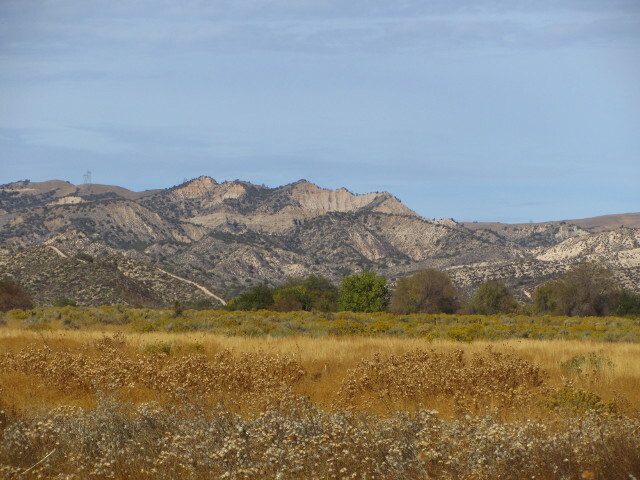 In the morning, I packed up and headed off with a few hours yet before noon and duties, so I took a left at a road into Hungry Valley, headed to Gold Hill and up and around Alamo Mountain, which was spectacular. I returned a few times to Alamo Mountain that summer and in the years since, but have never been back to Hardluck. Now I've decided that maybe Hardluck has a little more to offer. Unfortunately, that offering doesn't include an open road into it in spite of the Forest Service website saying it is. I joined another car parked off the road at the gate just 100 feet from a sign saying it was still 3.1 miles to Hardluck. With a lot of daylight wasted and no good idea for another hike, I pocketed the bit of map for the trail extending downstream from Hardluck, shouldered my pack, and decided it was fitting. I could easily return on the road in the dark, so could still get a few miles of trail in. Perhaps this was my first bit of foolishness for the day. I'm not sure why hiking a dark but smooth road should be much more dangerous than camping, but that does presuppose that I actually return by the road. Looking north to Hungry Valley State Vehicular Recreation Area where there are some impressive bluffs, while nearby there are fenced off flats. Location map link for when Google eats the embedded map again. There are threats that the various back country roads will generally be closed up on November 1 from now on, but for now they are open to allow access for deer hunters. 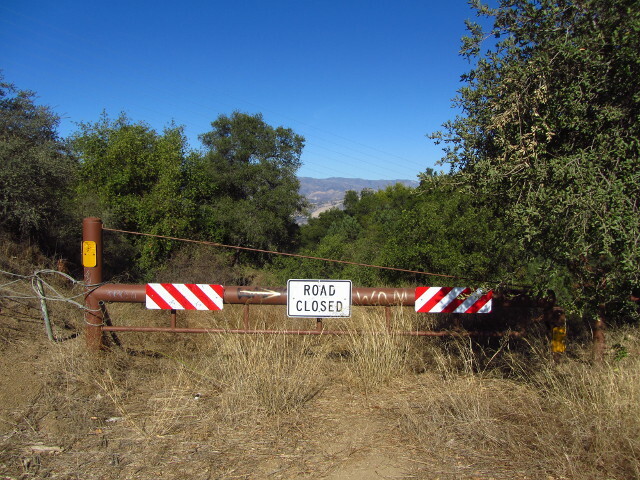 I decided to take advantage of the open gates and cooler temperatures due to a coming storm to head up Gold Hill Road and stop just before the ford at Piru Creek where a trail follows the path of the creek upward. My map shows this route going out the back of a few dirt roads around Gold Hill Campground. I found it to be resplendent in autumn colors. I took a peek at the ford to be sure there was water in the creek since other reliable ribbons of wet seem to be drying out this year, then turned in and drove up the creek stopping near a bit of fence to discourage further motor vehicle traffic. I grabbed water and food and art supplies and headed out along the trail that snakes around the side of the fence to see what I could see. 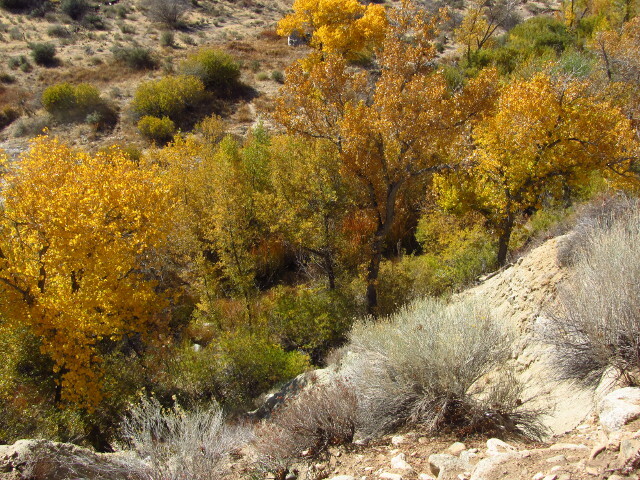 The poplar trees lining Piru Creek are turning gold with the changing seasons. A small trail overgrown with reeds goes to another area that can be reached by car, which was demonstrated by a car parked there. I found a larger path and continued down it for a bit, but the smaller paths that go out near the cliff edge to look down on the creek looked more interesting, so I kept going that way. The whole area is a choose your own adventure. My large path crosses through a fence to a road and I decided I liked the footpath better and turned back to the cliff side again. This brought me past what is presumably something left of the mine marked on the map. After the mine workings, it becomes quite faint and dumped me down into the creek itself at a dry tributary. I tried a route that climbs back up the other side of the tributary, but this just delayed being in the bottom for a few more feet. The initial portion of trail that heads away from the creek across the dry flat. I headed down to hike with the geeks who planned on another attack up the steep trail that climbs from Harvard up to the communications site toward the top of the mountain. It is a short, steep, trail with a bit of a crowd in the morning until the heat gets to be a bit much. 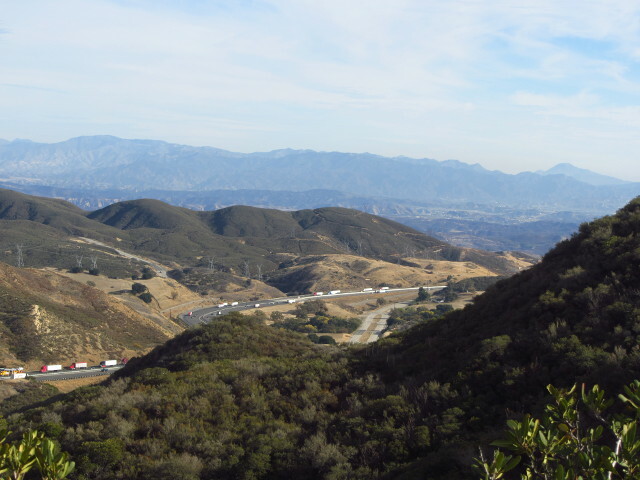 We start climbing when it is quite warm enough up the first of three trails that leave the road and head up, quickly catching a bit of view out over Burbank. 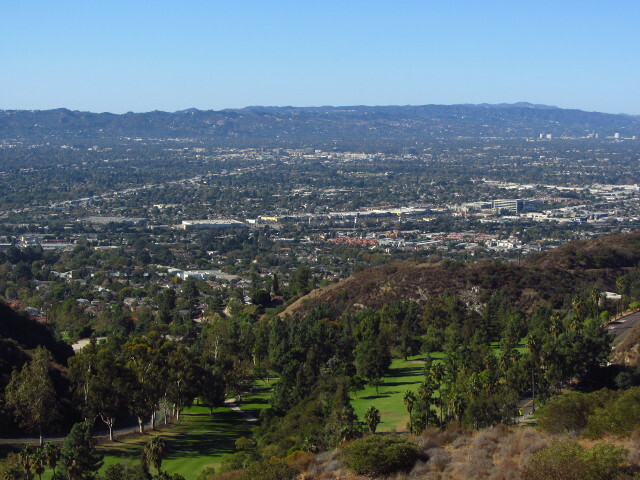 The trail quickly gains a view of the nearby golf course and city beyond. After failing plan A and plan B and finished poking around the old bit of highway bridge, I returned to Refugio to put plan C into motion. 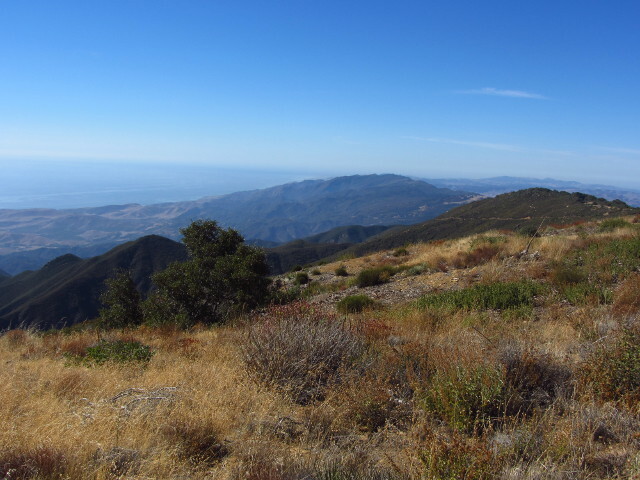 I would head up to Camino Cielo along Refugio Road and then see what it was like on the way to San Marcos Pass. As I start to climb, I come to a sign saying there is a bridge out 10 miles ahead and the road is closed to through traffic in 7 miles. It doesn't look so good for plan C, and I was thinking that the plan would most likely fail because the road isn't good enough to travel in a little car with six inches of clearance. I continue up the road anyway. Refugio is a tight, shady canyon. 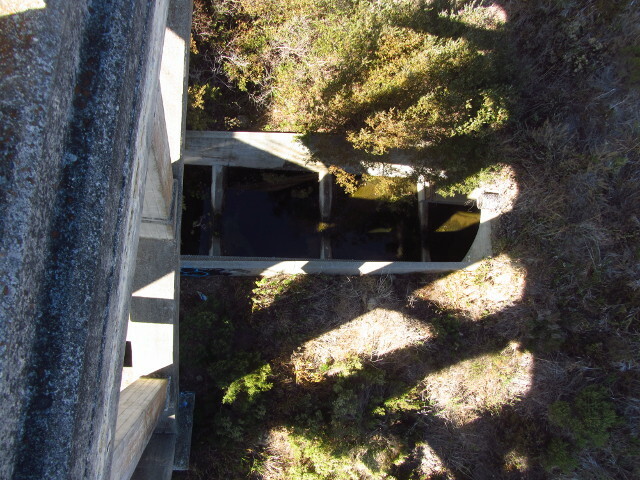 In the lower section, it crosses back and forth over the stream. It makes one crossing warning of a narrow bridge, widens back up for about 10 feet, then narrows down even further and pretty much stays that way. I have a fair amount of traffic coming down the hill at me including a small FedEx truck, but there were plenty of wider spots to allow passing. The road starts to climb out of the canyon and widens to something very comfortable for driving and dodging people leaving their cars with the doors wide open while they pick up their mail. Once the road is really climbing, it makes a few tight turns and the hillsides are much brighter but much browner as well. I should note that the road is full of pot holes and patches. In spots, it gets quite lumpy. A road appears to my right, and without a road sign, I'm not sure it is the one I want. Refugio says the bridge is out in 2 more miles. I'm not sure what was supposed to happen a mile ago, but I didn't notice it whatever it was. The road to the right says it is unmaintained and the county takes no responsibility for anything you may do to yourself or your property while traveling on it. 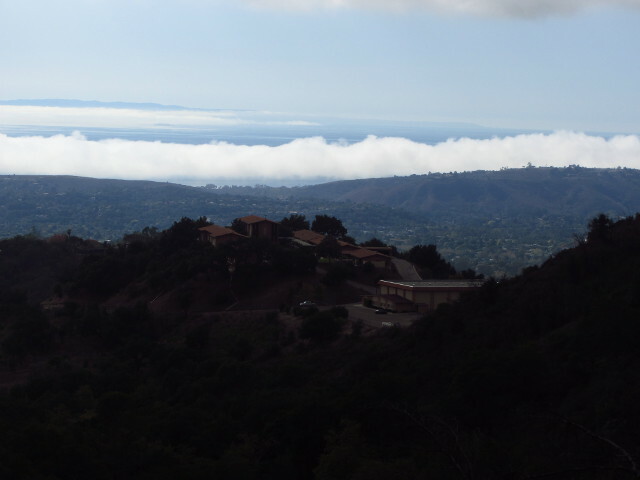 I decide it must be Camino Cielo, and turn down it. Soon after, I realize that Refugio was headed down again, so this really has to be the sky road I am looking for. Initially, the road is beautiful and smooth. It does not seem like it should have such a dire warning on it, but I know the pavement won't last. In the distance, a number of peaks are decorated with antennas and this road is only paved to the spur up to the first one. Who can worry about that as views open up to left and right? 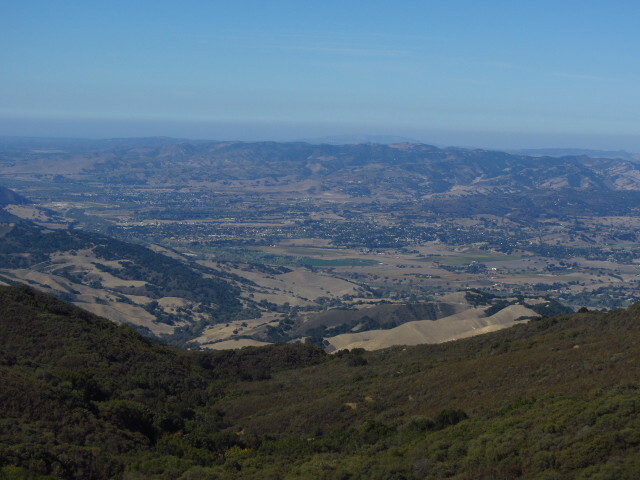 Solvang from West Camino Cielo. 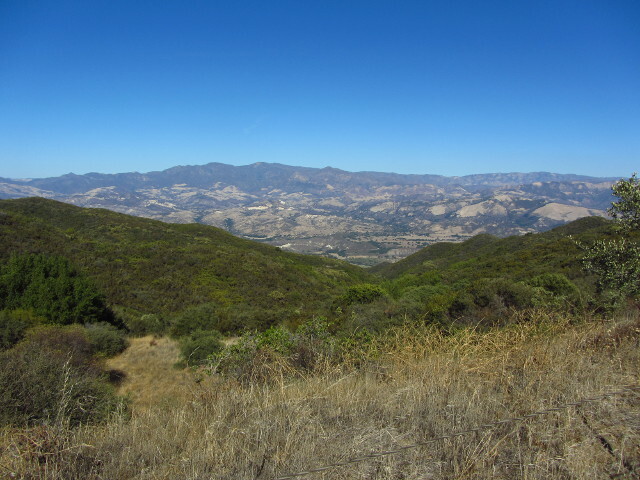 At first, the northern views are of Solvang and the surrounding area. Southern views show islands and canyons and the odd ridge. The hard layers of rocks seem to stick out more along here, having had the soft layers around them eroded on both sides. Perhaps it is just that they are light layers among the greening land. I come to the first spur road to the towers and the pavement ends as expected. The road beyond is rough, but passable and still wide giving many options for travel. It is also designate with a vertical number which is code for 4WD road. 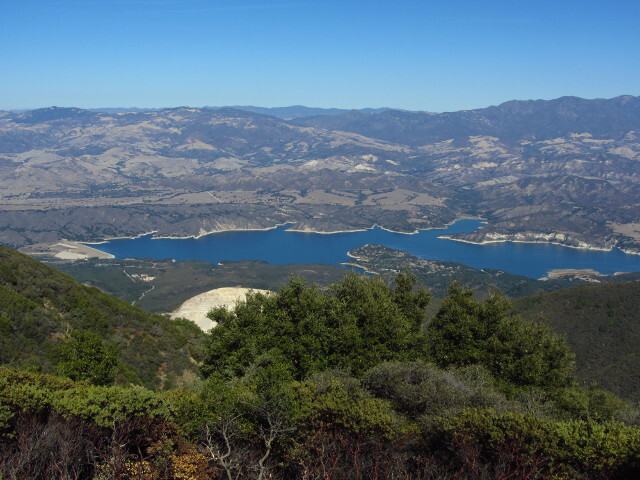 Lake Cachuma looks a little low, displaying a bright white stripe around the edge. Looking back somewhat along the ridge. Immediately after the last spur road, a forest gate stands open, but could be used to bar the rest of the road from me for travel. After this gate, the road is often narrow for long stretches. I meet a motor bike coming the other way along one narrow bit. He seems not to know what to think of me as he gives my wheels a good looking over but seems to settle on amused. I give him a smile and a thumbs up as I navigate a patch not quite rough enough to shift down from second. A few patches do need first gear, but nothing really worries me throughout the whole road. What most gets to me are the sections where the sandstone has been carved away into a narrow roadway with high walls. I pass someone in blue enjoying the wind up on a point, but don't see what means he got there by so might be a hiker. I don't spot the trail I was looking for near where he was sitting. 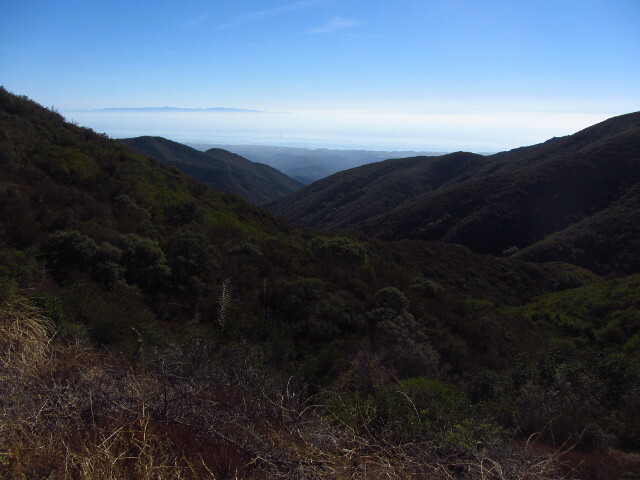 One of the valleys stretching toward the ocean. And the sea of mountains on the other side. After stopping a few times for the view, I stop one more time at a locked gate. I was looking for the top of a couple trails, but not closely enough. To be honest, the road has taken a bit more of my attention than hoped and I haven't been able to enjoy the view as well as I would like so it would be easy to have missed the trails even if they are fairly easy to find. A bare foot path is easily seen in the dead grasses covering the road, so at least I did find one trail. While I'm parked, a truck with plenty of clearance passes going the other way. Where there was once a road, there is now a trail heading down from this gate. I can hear many gun shots while I'm stopped, but could hear them the last couple of stops too. The sounds seem to travel well. This time, though, it is just a quick climb up to the gun club and smooth, wide pavement. Just before reaching the pavement, I find two more people walking down the road. They seemed particularly worried about my wheels. They had parked an SUV at the end of the pavement, so I guess they were worried about their own that should have been more capable. Once on the pavement, there seems to be quite a crowd. Many cars are parked at the gun club, and two more are at the other side of the road for the view. I pass many cars on the road and many more parked in bunches on the side. The road drops in tight turns through trees and in very little time I find myself at the pass with a fairly strait shot home. All in all, a very fun little drive with exquisite views, although it would get downright scary if I was meeting people as much on the dirt as I was on the pavement. 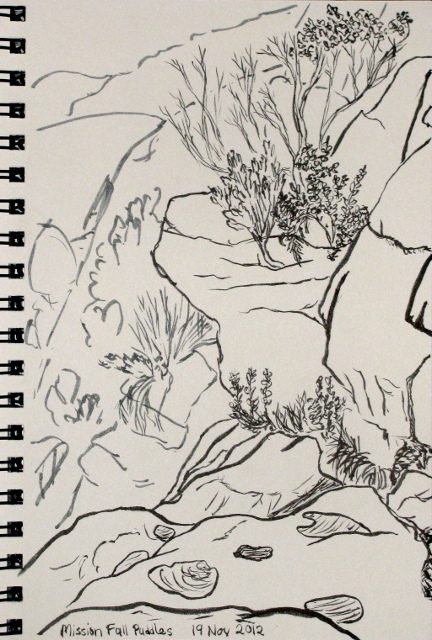 I set out today to hike Dos Pueblos Canyon or Arroyo Hondo, but didn't end up at either. There is an exit for Dos Pueblos, but turning down the actual road means coming to a sign saying, "Private Road, no thru traffic". I have no idea what anyone would to "thru" or through on this road to. It is supposed to go up the canyon a ways and stop. A couple trucks passed me as I glared at the sign and my map, but neither felt much like helping. The road did not look in particularly good shape and since I had a plan B, I thought I'd go with it. Somewhere further is Arroyo Hondo. 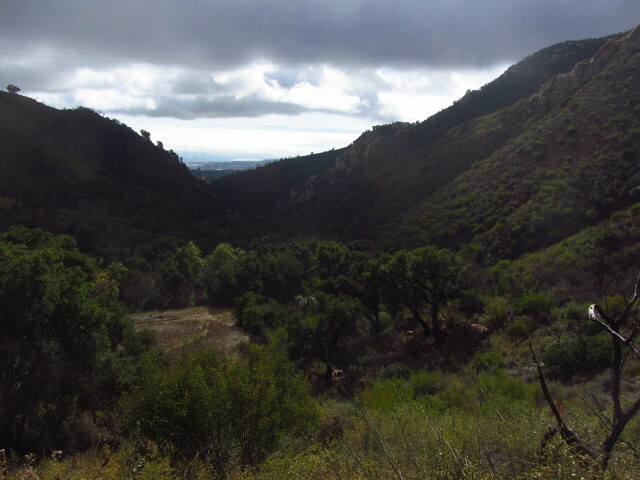 I found Arroyo Hondo Preserve very soon after, sooner than expected in fact. They do not want people coming in unannounced, though. I was expecting a friendly parking lot with a trail opened about a year ago, this isn't it. I continued along failing to find something promising or a sign to designate it. I turned around and did something I've kind of been wanting to do for a while instead. 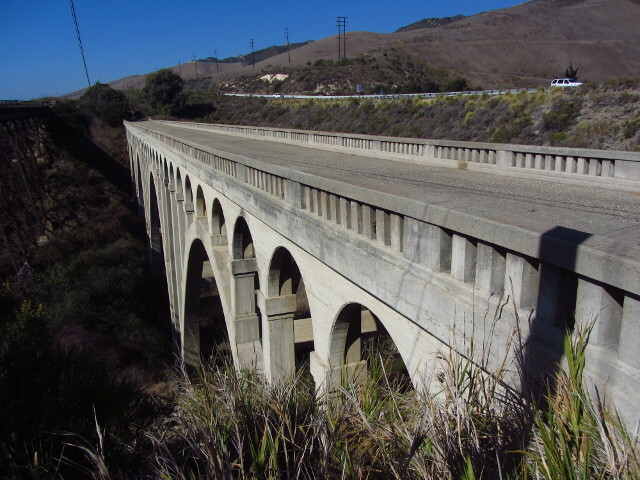 When traveling near Gaviota along the decidedly east-west section of highways 101 and 1, one often catches a glimpse of a huge bridge. It is lower than the level of the freeway, so you can see the black top stretching across it. 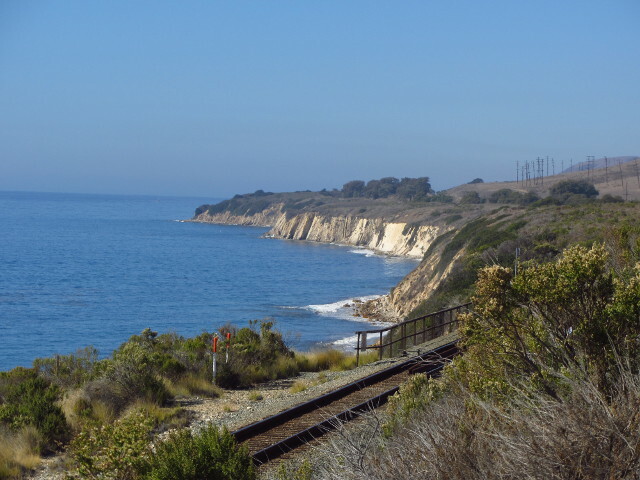 This long narrow expanse once carried the traffic of the main route from Los Angeles to San Francisco and it is easy to visit, if you are traveling southbound, by getting off at a "vista point" that is directly east of it. Park along the side and walk west to the bridge. Old highway bridge over Arroyo Hondo. The bridge has been left with no barriers of any kind and is still quite solid. My childhood memories claim there was a sign here explaining its purpose for being, but that has been replaced with a sign about the fish ladder that has been built to allow the trout to come back to Arroyo Hondo. (Ah ha! A clue for finding the place next time, this is the canyon.) A quick search confirms that there was a sign and adds that the bridge was built in 1918 and carried state route 2, a moniker for a very different road now. I walked across the bridge and examined the ends for a date, but could not find one. Although it was the whole highway once, the reflectors that remain hint that it became just southbound at some point. I could look down directly to the fish ladder that is now the talk of the local signage. The current highway rattles over a lot of fill and the stream went through a culvert previously. In low water, there is not enough for the fish to swim through and in high water, the surge of water is too great to allow the trout to swim upstream. Now that has been replaced with this series of pools so that the steelhead can return to this stream. 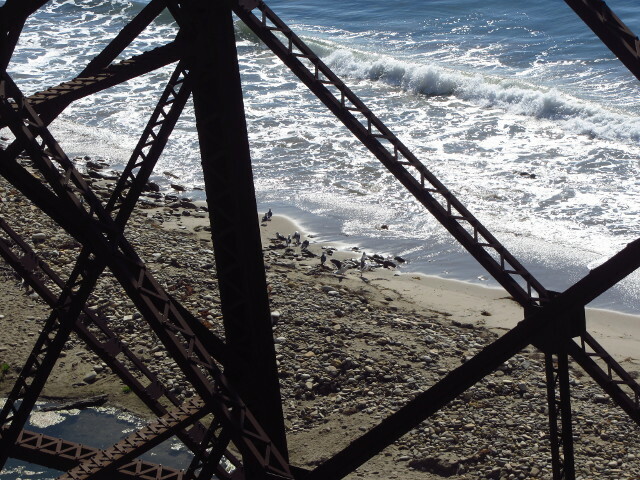 Gulls on the beach through the trestle bridge. Of course, there is a vista at this vista as well. The coast is quite spectacular. Three islands can be seen: Santa Cruz, Santa Rosa, and San Miguel. Today visibility is not as good as it could be, but the islands still peek out over the lower haze. A small plane flew by eastward very, very low over the water, then returned westward. The coastal view looking west. 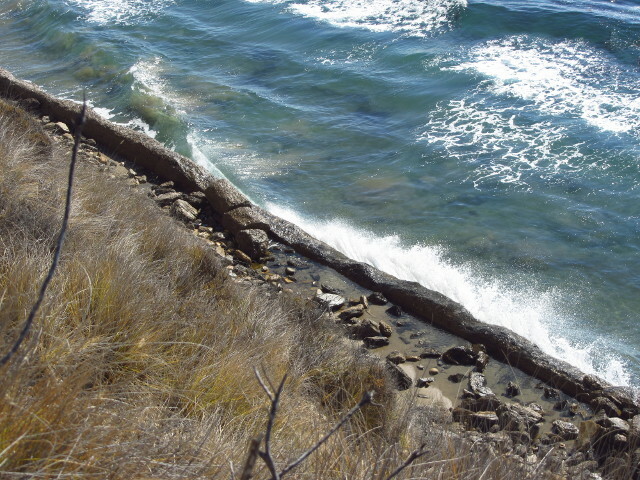 Crossing the train tracks and looking down, there is a remnant of sea wall. The high tide waves were crashing against it. In one spot, they produced a geyser. The splashes and the reflecting waves were fun to watch. The foam makes different patterns where the water turns back. A wave hitting the sea wall. It forms, hits, splashes, and reflects into the next wave.